토큰 버킷들을 비제로 값으로 초기화하고, 스케쥴링된 그랜트를 수신하고, 스케쥴링된 그랜트를 수신하는 것에 응답하여 데이터를 전송하는 방법 및 장치가 제공된다. A method and apparatus to initialize token bucket to a non-zero value, to receive a scheduling grant and, in response to receiving a scheduling grant for transmitting data is provided. 또한, 매체 접속 제어(MAC) 리셋을 개시하고, MAC 리셋 동안에 토큰 버킷의 값을 유지할지 여부 또는 토큰 버킷의 값을 재초기화할지 여부를 결정하는 방법 및 장치가 제공된다. In addition, a method and apparatus are provided for determining whether a medium access control (MAC) reset and starts to, MAC re-initialize the value of a token bucket or whether to keep the value of the token bucket during the reset. 또한, 토큰 상태 리포트를 발생시키라는 요청을 수신하고(605), 토큰 상태 리포트를 발생시키고(610), 토큰 상태 리포트를 전달하는(615) 방법 및 장치가 제공된다. Further, in case of Kira the token status report, and receiving a request (605), the 615 method and apparatus for generating a token status report, and 610, passes the token status report is provided. 도 1은 롱텀 이볼루션(LTE; Long Term Evolution) 아키텍쳐에 대한 통상적인 사용자 평면 프로토콜 스택(100)을 나타낸다. Figure 1 is a long-term evolution; shows a conventional user plane protocol stack 100 for the (LTE Long Term Evolution) architecture. 스택(100)은 무선 송수신 유닛(WTRU; wireless transmit receive unit)에서는 패킷 데이터 컨버전스 프로토콜(PDCP; Packet Data Convergence Protocol) 계층, 무선 링크 제어(RLC; Radio Link Control) 계층, 매체 접속 제어(MAC; Medium Access Control) 계층, 및 물리(PHY; physical) 계층을 포함하며, eNB(evolved Node-B)에서는 대응하는 계층들을 포함한다. Stack 100 includes a wireless transmit receive unit (WTRU; wireless transmit receive unit) in the packet data convergence protocol (PDCP; Packet Data Convergence Protocol) layer, a radio link control (RLC; Radio Link Control) layer, a medium access control (MAC; Medium Access Control) layer, and a physical (PHY; including physical) layer, and includes those in the corresponding layer of eNB (evolved Node-B). eNB는 Sl-U 인터페이스에 의해 시스템 아키텍쳐 이볼루션(System Architecture Evolution; SAE) 게이트웨이에 접속된다. The eNB system architecture evolution by an Sl-U interface; is connected to the (System Architecture Evolution SAE) gateway. 3세대 파트너쉽 프로젝트(3GPP; Third Generation Partnership Project) 표준에 따르면, LTE MAC 부계층은 논리 채널과 전송 채널 사이의 매핑을 지원한다. 3rd Generation Partnership Project; according to (3GPP Third Generation Partnership Project) standard, LTE MAC sublayer supports mapping between logical channels and transport channels. MAC 부계층은 전송 채널들을 통한 PHY 계층으로의 전달을 위하여 하나 이상의 논리 채널들로부터 전송 블록(TB; transport blocks) 상으로의 MAC 서비스 데이터 유닛(SDU; service data unit)들의 다중화를 지원한다. The MAC sublayer is the transport block from the one or more logical channels for transfer to the PHY layer through a transport channel to support the multiplexing of;; (service data unit SDU) (TB transport blocks) MAC service data units of the image. 또한 MAC 부계층은 PHY 계층으로부터 전송 채널들을 통하여 전달된 TB들로부터의, 하나 이상의 논리 채널들로부터의 MAC의 역다중화를 지원한다. The MAC sublayer also supports demultiplexing of the MAC from one or more logical channels from the TB transmitted via the transport channel from the PHY layer. 추가로, MAC 부계층은 논리 채널 우선순위화 및 전송 형식 선택을 지원한다. In addition, MAC sublayer supports logical channel prioritization and transmission format selection. MAC 부계층의 기능은 논리 채널들의 우선순위화이다. Functions of the MAC sublayer is a priority of the logical channel prioritization. MAC 엔티티는 RLC 계층으로부터 오는 서로 다른 논리 채널들로부터의 MAC SDU들을 수신할 수 있다. MAC entity may receive the MAC SDU from different logical channels coming from the RLC layer. 그 후, MAC 엔티티는 SDU들을 하나의 전송 채널 상에 다중화한다. Then, MAC entity multiplexes SDU onto one transport channel. 도 2는 복수의 논리 채널들로부터 하나의 전송 채널 상에의 MAC 다중화 데이터를 나타낸다. Figure 2 shows the MAC multiplexing data from one to the transport channels from a plurality of logical channels. 복수의 논리 채널들은 전용 트래픽 채널들(DTCH; dedicated traffic channel), 전용 제어 채널들(DCCH; dedicated control channel), 또는 공통 제어 채널들(CCCH; common control channel)을 포함할 수 있다. A plurality of logical channels are dedicated traffic channels may include; (common control channel CCCH) (DTCH;; dedicated traffic channel), the dedicated control channel (DCCH dedicated control channel), or common control channels. 도 2의 예에서, 하나의 전송 채널은 업링크 공유 채널(UL-SCH; uplink shared channel)로서 나타나 있다. In Figure 2, the one transport channel is an uplink shared channel, is shown as (UL-SCH uplink shared channel). 새로운 MAC 전송을 수행할 때, 논리 채널 우선순위화를 적용한다. When you perform a new MAC transmission, apply the logical channel prioritization. WTRU에서의 무선 자원 제어(RRC; radio resource control) 부계층은 각각의 논리 채널에 우선순위 값을 할당함으로써 업링크 데이터의 스케쥴링을 제어한다. RRC in the WTRU (RRC; radio resource control) sub-layer controls the scheduling of uplink data by assigning a priority value to each of the logical channels. 우선순위값이 증가할수록 논리 채널에 대해 우선순위 레벨이 더 낮은 것으로 나타난다. As the first rank value increases appear to be a lower priority level for the logical channel. 추가적으로, 각각의 논리 채널은 우선순위가 정해진 비트 레이트(PBR; prioritized bit rate) 및 최대 비트 레이트(MBR; maximum bit rate)를 할당받는다. Additionally, each logical channel has a fixed bit-rate priority assigned a;; (maximum bit rate MBR) (PBR prioritized bit rate) and the maximum bit rate. WTRU는 논리 채널들의 구성된 PBR까지 감소하는 우선순위 순서로 모든 논리 채널들을 서브한다. The WTRU serve all the logical channels with the priority order in which to reduce configured PBR of a logical channel. 임의의 자원들이 남아 있으면, 모든 논리 채널들은 논리 채널들의 구성된 MBR까지 감소하는 우선순위 순서로 서브된다. If any resources remain, all the logical channels are reduced to sub-in priority order to MBR composed of logical channels. MBR이 구성되지 않으면, 논리 채널에 대한 데이터가 소진될 때까지 또는 업링크 그랜트가 소진될 때까지 - 어떤것이 먼저 오던 간에 - 논리 채널들을 서브한다. If you do not configure the MBR, until the data for the logical channel to be an uplink grant or until the exhausted exhaustion - and the sub logical channels - something between the first ohdeon. WTRU는 동일한 우선순위로 동일하게 구성된 모든 논리 채널들을 서브한다. The WTRU serve all the logical channels are configured in the same manner with the same priority. 버퍼 상태 리포트(BSR; buffer status report)에 대한 MAC 제어 엘리먼트는 BSR 패딩을 제외하고는 사용자 평면 논리 채널들 보다 더 높은 우선순위를 갖는다. Buffer status reporting; MAC Control element to the (BSR buffer status report) is to have a higher priority than user plane logical channels except for padding BSR. 3GPP 표준들에서, WTRU는 무선 베어러들 간에 업링크 자원들을 공유하는 것을 관리하는 업링크 레이트 제어 기능을 갖는다. In the 3GPP standard, WTRU has an uplink rate control function which manages the sharing of uplink resources between radio bearers. RRC는 각각의 베어러에 우선순위와 PBR을 제공함으로써 업리크 레이트 제어 기능을 제어한다. RRC controls the uplink rate control function by providing a leakage position and PBR priority to each of the bearer. RRC는 또한 보장된 비트 레이트(GBR; guaranteed bit rate) 베어러 마다 MBR을 제공한다. RRC is also the bit-rate guaranteed; provides an MBR per (guaranteed bit rate GBR) bearer. WTRU에 의해 시그널링된 값들은 인터페이스(Sl)를 통하여 eNB에 시그널링된 값들과 관련될 수 없다. The values ​​signaled by the WTRU may not be related to the values ​​signaled to the eNB via an interface (Sl). 하나 보다 많은 무선 베어러가 동일한 우선 순위를 갖는다면, WTRU는 이들 무선 베어러를 동일하게 서브한다. If the number of radio bearer than the one that has the same priority, WTRU will equally serve these radio bearers. 논리 채널 우선순위화 및 MAC 다중화의 세부 내용을 설명하는 많은 제안들이 존재한다. There are a number of proposals to explain the details of the first logical channel prioritization and MAC multiplexing. 이들 제안은 WTRU의 출력에 대한 구속 조건들과 입력 파라미터들을 특정하는 것에 동의한다. These proposals should agree to the specific constraints and the input parameters for the output of the WTRU. 제안들은 입력 파라미터들의 사양에 대한 토큰 버킷 모델을 가정한다. Proposals assume a token bucket model for the specification of input parameters. PBR 또는 MBR은 토큰 레이트를 이용하여 WTRU로부터 고정된 크기로부터 유도되거나 또는 eNB로부터 시그널링된다. PBR or the MBR is derived from the signaling from a fixed size from the WTRU using the token rate or eNB. PBR 또는 GBR은 보고된 버퍼 상태를 제한하지 않는다. PBR or the GBR does not limit the reported buffer status. 제안들은 토큰 버킷 모델을 이용하여 레이트 계산들을 기술하며, 이에 의해 각각의 논리 채널이 PBR 및 MBR에 관한 토큰 버킷들을 가질 수 있다. It is also proposed a technique rate calculated using the token bucket model, whereby each logical channel may have token buckets by about the PBR and MBR. 토큰들이 버킷들 내에 추가되는 레이트들은 PBR 및 MBR이다. Token rate to be added within the buckets are the PBR and MBR. 토큰 버킷들의 크기는 미리 정해진 최대값을 초과할 수 없다. Of the token bucket size can not exceed a predetermined maximum value. 하나의 제안은 레이트 계산들 또는 토큰 버킷 계산들에 대한 프로세스를 설명한다. One proposal describes a process for rate calculations or token bucket calculations. PBR을 갖는 베어러(Tj)가 증가할 때마다, 베어러 j와 관련된 PBR 크레딧(credit)은 Tj × PBRj의 값만큼 증가된다. Each time increasing the bearer (Tj) has a PBR, PBR credit (credit) associated with the bearer j is incremented by a value of Tj × PBRj. 베어러가 또한 MBR을 갖는다면, 베어러 j와 관련된 MBR 크레딧은 Tj × MBRj의 값만큼 증가된다. If the bearer also has an MBR, MBR credit associated with the bearer j it is incremented by a value of Tj × MBRj. 최대 PBR에 대한 상한값들이 설정되면, 그리고 계산된 값들이 최대값들을 초과하면, 계산된 값들은 최대값으로 설정된다. If the upper limit value are set for the maximum PBR, and if the calculated values ​​are greater than the maximum value, the calculated values ​​are set to the maximum value. 베어러 j에 대한 MBR 크레딧들이 설정되면, 그리고 축적된 값들이 최대값들을 초과한다면, 축적된 값들은 최대 값으로 설정된다. After MBR credits are set for the bearer j, and if the accumulated values ​​exceed the maximum value, the accumulated values ​​are set to the maximum value. WTRU가 새로운 데이터를 전송하는 것이 허용되어진 각각의 스케쥴링 기회 전송 시간 간격(TTI; transmission time interval)에서, 스케쥴러는 비어 있지 않은 버퍼 상태와 비제로(non-zero) PBR 크레딧을 갖는 최고 우선순위 베어러로부터 데이터를 선택한다. WTRU that each scheduling opportunity transmission time interval been permitted to transmit new data; in (TTI transmission time interval), the scheduler from the highest priority bearer that has a non-empty buffer state and non-limiting to the (non-zero) PBR credit selects data. 스케쥴러는 버퍼의 크기, PBR 크레딧의 크기, 또는 TB의 이용가능한 용량과 동일하게 - 어느 것이 더 작든 간에 - TB 데이터에 추가할 수 있다. The scheduler buffer size, the size of the PBR credit, or the same as the available capacity of the TB - can be added to the TB data - between which is more or small. PBR 크레딧과 MBR 크레딧은 할당받은 데이터량만큼 감소될 수 있다. PBR credit and the MBR credit may be reduced by the amount of data assigned. 모든 베어러들의 PBR 크레딧이 제로이고 TB 내에 이용가능한 공간이 있다면,스케쥴러는 TB 내의 이용가능한 공간의 크기 또는 WTRU의 MBR 크레딧까지 - 어느 것이 더 작든 간에 - , 버퍼링된 데이터를 갖는 최고 우선순위 베어러로부터 데이터를 수락한다. If there is space available within, and the PBR credit of all bearers zero TB, the scheduler is to use a size or MBR credit of the WTRU in the space in the TB-data from the highest priority bearer with a buffered data - between which is more small, to be accepted. MBR 크레딧은 수락되었던 데이터량만큼 감소된다. MBR credit is decremented by the amount of data that was accepted. 도 3은 MAC 헤더, MAC 제어 엘리먼트, MAC SDU 및 패딩 비트들을 포함하는 통상적인 MAC 프로토콜 데이터 유닛(PDU)을 나타낸다. Figure 3 shows a conventional MAC protocol data unit (PDU) including a MAC header, MAC Control elements, MAC SDU, and padding bits. MAC 헤더와 MAC SDU들은 가변 크기로 이루어질 수 있다. MAC header and a MAC SDU can be made with a variable size. MAC PDU 헤더는 적어도 하나의 MAC PDU 서브-헤더를 가질 수 있고 여기서 각각의 서브-헤더는 MAC SDU, MAC 제어 엘리먼트 또는 패딩 비트에 대응한다. MAC PDU header includes at least one MAC PDU sub-header corresponding to a MAC SDU, MAC control element or padding bits - may have a header, and wherein each of the sub. MAC 계층은 BSR 제어 엘리먼트와 같은 MAC 제어 엘리먼트를 발생시킬 수 있다. The MAC layer may generate MAC control elements, such as the BSR control element. 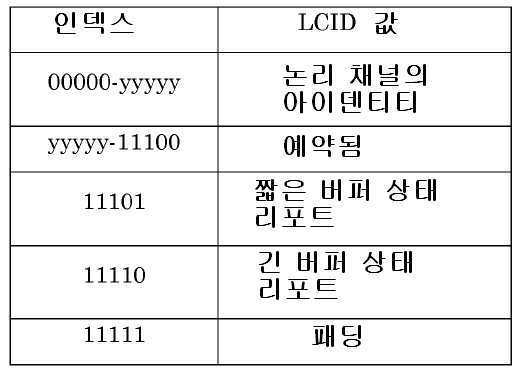 MAC 제어 엘리먼트들은 아래 표 1에 나타낸 바와 같이, 논리 채널 ID(LCID; Logical Channel ID)에 대한 특정값들을 통하여 식별될 수 있다. MAC control elements are as shown in Table 1 below, the logical channel ID; may be identified via specific values ​​for the (LCID Logical Channel ID). 표 1에 나타낸 인덱스, OOOOO-yyyyy는 대응하는 RLC 엔티티들을 갖는 실제 논리 채널들에 대응할 수 있다. Index, OOOOO-yyyyy shown in Table 1 may correspond to actual logical channels that have corresponding RLC entities. 나머지 인덱스들은 BSR 또는 패딩과 같은 MAC 제어 엘리먼트를 식별하는데 이용될 수 있다. The remaining indexes may be used for identifying the MAC control elements such as BSR or padding. 3GPP 표준에 따르면, LTE RLC 부계층의 일부 서비스 및 기능들은 확인응답 모드(AM; acknowledged mode) 또는 비확인응답 모드(UM; unacknowledged mode)를 지원하는 상위 계층 PDU들의 전송을 포함한다. According to the 3GPP standards, some services and functions of the LTE RLC sublayer are acknowledged mode a transmission of upper layer PDU supporting;; (unacknowledged mode UM) (AM acknowledged mode) or a non-acknowledgment mode. RLC 부계층은 또한 투과 모드(TM; transparent mode) 데이터 전송, 자동 반복 요청(ARQ; automatic repeat request)을 통한 에러 수정, (업링크에서의 핸드오버시를 제외한) 상위 계층 PDU들의 시퀀스내 전달, eNB와 WTRU 사이의 플로우 제어, SDU 폐기 및 RLC 리셋을 포함한다. RLC sublayer also transmission mode (TM; transparent mode) data transmission, automatic repeat request (ARQ; automatic repeat request), the through error correction, (except for the handover in the uplink) passed in the sequence of higher-layer PDU, It includes a flow control, SDU discard, and RLC reset between the eNB and WTRU. 따라서, RLC는 3개의 동작 모드 - AM, UM 및 TM - 를 지원한다. Therefore, RLC has three modes of operation-support-AM, UM and TM. 따라서, 서비스 연속성을 보장하고 서비스 인터럽션을 최소화하기 위하여, 토큰 버킷들을 초기화하고, 특정 이벤트시 토큰 버킷들을 유지하고, 토큰 버킷들을 재구성하고, 인핸스드 BSR들 또는 새로운 제어 엘리먼트를 이용하여 토큰 버킷들의 상태를 전달하는 방법 및 장치를 제공하는 것이 바람직하다. Therefore, in order to minimize the guarantee and service interruption, service continuity, of initializing the token bucket and token bucket to keep certain events during the token bucket, and to reconstruct the token bucket using an enhanced BSR or a new control element it is desirable to provide a method and apparatus for transmitting a status. 토큰 버킷을 비제로 값으로 초기화하고 스케쥴링 그랜트를 수신하고, 그랜트를 수신하는 것에 응답하여 데이터를 전송하는 방법 및 장치가 제공된다. Initialize a token bucket to a non-zero value, to receive a scheduling grant, and there is provided a method and apparatus for in response to receiving a grant transmit data. 매체 접속 제어(MAC) 리셋을 개시하고, MAC 리셋 동안에 토큰 버킷의 값을 유지할지 여부 또는 토큰 버킷의 값을 재초기화할지 여부를 결정하고, 토큰 버킷의 값을 유지한다는 결정에 응답하여 토큰 버킷의 값을 유지하고, 토큰 버킷의 값을 재초기화한다는 결정에 응답하여 토큰 버킷의 값을 재초기화하는 방법 및 장치가 제공된다. A medium access control (MAC) initiate a reset and MAC reset during the decision whether to reinitialize the value of whether or token bucket to keep the value of the token bucket, in response to a determination that maintaining the value of the token bucket of a token bucket maintaining a value, in response to a determination that the re-initializing the value of a token bucket to a method and apparatus for re-initializing the value of the token bucket is provided. 토큰 상태 리포트를 발생시키라는 요청을 수신하고 - 상기 요청은 매체 접속 제어(MAC) 엘리먼트의 일부로서 수신됨 -, 요청에 응답하여 토큰 상태 리포트를 발생시키고, 버퍼 상태 리포트의 일부로서 토큰의 총량을 전송하는 방법 및 장치가 제공된다. In case of the token status report Kira receives the request, the request being received as part of a medium access control (MAC) element - in response to a request to generate a token status report, the total amount of tokens as part of a buffer status report the method for transmitting and apparatus is provided. 본 발명의 구성에 따르면, 서비스 연속성을 보장하고 서비스 인터럽션을 최소화할 수 있다. According to the configuration of the present invention, it is possible to ensure the service continuity and to minimize service interruption. 첨부된 도면과 함께 예를 들어 주어진 다음의 설명으로부터 보다 자세한 이해가 이루어질 수 있다. In conjunction with the accompanying drawings, for example, it can be understood more than the given from the following description. 도 1은 통상적인 LTE 사용자 평면 프로토콜 스택을 나타낸다. 1 shows a conventional LTE user plane protocol stack. 도 2는 업링크 통신에 대한 통상적인 MAC 매핑 및 다중화를 나타내는 도면이다. 2 shows a conventional MAC mapping and multiplexing for uplink communication. 도 3은 3GPP 표준 사양에 따른 통상적인 MAC PDU 구조를 나타낸다. 3 shows a conventional MAC PDU structure according to a 3GPP standard specification. 도 4는 복수의 WTRU들과 eNB를 포함하는 예시적인 무선 통신 시스템을 나타낸다. Figure 4 shows an example wireless communication system including a plurality of the WTRU and the eNB. 도 5는 도 4에 도시된 무선 통신 시스템의 WTRU와 eNB의 예시적인 기능 블록도를 나타낸다. Figure 5 illustrates an exemplary functional block diagram of a WTRU and the eNB of the wireless communication system is also shown in Fig. 도 6은 토큰 상태 리포트를 처리하는 방법의 예시적인 플로우도를 나타낸다. 6 illustrates an exemplary flow of a method of processing a token status report Fig. 이하, 언급될 때, 용어 "무선 송수신 유닛(WTRU)"은 이들에 한정되는 것은 아니지만 사용자 장치(UE), 이동국, 고정 또는 가입자 유닛, 페이저, 셀룰라 전화기, 개인 휴대 정보 단말기(PDA), 컴퓨터, 또는 무선 환경에서 동작가능한 임의의 다른 유형의 사용자 디바이스를 포함한다. When the hereinafter mentioned, the term "wireless transmit receive unit (WTRU)" is but not limited to a user equipment (UE), a mobile station, a fixed or a subscriber unit, a pager, a cellular telephone, a personal digital assistant (PDA), a computer, or operable any other type of user device in a wireless environment. 이하에 언급될 때, 용어 "기지국"은 이들에 한정되는 것은 아니지만 노드-B, 사이트 컨트롤러, 액세스 포인트(AP), 또는 무선 환경에서 동작가능한 임의의 다른 유형의 인터페이싱 디바이스를 포함한다. When referred to hereinafter, the term "base station" is included but not limited to a Node -B, a site controller, an access point (AP), or any other type of operation possible of interfacing device in a wireless environment. 이하, RLC PDU들 또는 RLC PDU 세그먼트는 MAC SDU들에 등가인 것으로서 간주될 수 있다. Hereinafter, the RLC PDU or RLC PDU segments may be considered as being equivalent to the MAC SDU. 추가로, 토큰/크레딧 버킷을 업데이트하는 것을 언급할 때, 이는 버킷 업데이트 간격에 있어서, MAC SDU 크기(들)에 대응하는 양을 갖는 버킷으로부터 토큰/크레딧들의 양을 감산하거나 또는 토큰/크레딧들을 가산하는 것을 의미하는 것으로서 간주된다. Further, when referring to updating the token / credit bucket, which bucket updating in the gap, MAC SDU size (s) corresponding to the amount to subtract the amount of tokens / credits from the bucket, or having or adding tokens / credits that the It is regarded as meaning that. 또한, 토큰 버킷 또는 크래딧 계산들은 데이터 레이트 계산 또는 레이트 제어 계산과 등가인 것으로서 간주될 수 있다. Also, token bucket, or credit calculations can be thought of as being the data rate calculations or rate control calculations equivalent. 추가로, 이하에서는 토큰/크레딧 버킷은 토큰 버킷으로서 언급될 것이다. In addition, hereinafter, the token / credit bucket will be referred to as a token bucket. 도 4는 복수의 WTRU들(410)과 eNB(420)를 포함한 예시적인 무선 통신 시스템(400)을 나타낸다. Figure 4 shows an example wireless communication system 400 including a plurality of the WTRU (410) and eNB (420). 도 4에 나타낸 바와 같이, WTRU들(410)은 eNB(420)와 통신한다. As shown in Figure 4, the WTRU 410 is in communication with the eNB (420). 3개의 WTRU들(410)과 하나의 eNB(420)가 도 1에 나타나 있지만, 무선 및 유선 디바이스의 임의의 조합이 무선 통신 시스템(400)에 포함될 수 있음을 알아야 한다. Shown in three WTRU 410 and the eNB of Figure 1 one (420), but any combination of wireless and wired devices to be understood that may be included in the wireless communication system 400. 도 5는 도 4의 무선 통신 시스템(400)의 WTRU(410) 및 eNB(420)의 기능 블록도(500)를 나타낸다. Figure 5 shows a WTRU (410) and a functional block diagram 500 of the eNB (420) of a wireless communication system 400 of FIG. 도 5에 도시된 바와 같이, WTRU(410)는 eNB(420)와 통신하며, WTRU(410)와 eNB(420) 양쪽 모두는 토큰 버킷들을 초기화, 유지 및 재구성하도록 구성될 수 있다. A, WTRU (410) as shown in Figure 5 is in communication with the eNB (420), both the WTRU (410) and eNB (420) may be configured to initialize the token bucket, maintenance and reconfiguration. 통상적인 WTRU에서 발견될 수 있는 컴포넌트들에 더하여, WTRU(410)는 프로세서(415), 수신기(416), 송신기(417) 및 안테나(418)를 포함한다. In addition to the components that may be found in a typical WTRU, and WTRU (410) includes a processor 415, a receiver 416, a transmitter 417 and antenna 418. 프로세서(415)는 토큰 버킷들을 초기화, 유지 및 재구성하는 방법을 수행하도록 구성된다. Processor 415 is configured to perform a method of initializing a token bucket, maintenance and reconfiguration. 수신기(416)와 송신기(417)는 프로세서(415)와 통신한다. The receiver 416 and the transmitter 417 are in communication with the processor 415. 안테나(418)는 수신기(416)와 송신기(417) 양쪽 모두와 통신하여, 무선 데이터의 전송 및 수신을 용이하게 한다. Antenna 418 is in communication with both the receiver 416 and transmitter 417, to facilitate the transmission and reception of wireless data. WTRU(410)는 아래 자세히 설명될 토큰 버킷 관리 엔티티(450)를 더 포함한다. The WTRU (410) further includes a token bucket management entity 450, to be described in more detail below. 통상적인 eNB에서 발견될 수 있는 컴포넌트에 더하여, eNB(420)는 프로세서(425), 수신기(426), 송신기(427) 및 안테나(428)를 포함한다. In addition to the components that may be found in a typical eNB, and eNB (420) includes a processor 425, a receiver 426, a transmitter 427 and antenna 428. 프로세서(425)는 토큰 버킷을 초기화, 유지 및 재구성하는 방법을 수행하도록 구성된다. Processor 425 is configured to perform a method of initializing a token bucket, maintenance and reconfiguration. 수신기(426)와 송신기(427)는 프로세서(425)와 통신한다. The receiver 426 and the transmitter 427 are in communication with the processor 425. 안테타(428)는 수신기(426) 및 송신기(427)와 통신하여, 무선 데이터의 전송 및 수신을 용이하게 한다. Other antenna 428 is in communication with the receiver 426 and the transmitter 427, to facilitate the transmission and reception of wireless data. 도 5를 계속해서 참조하여 보면, 토큰 버킷 관리 엔티티(450)는 토큰 버킷을 처리한다. Referring to FIG continues to 5, the token bucket management entity 450 processes token buckets. 즉, 토큰 버킷 관리 엔티티(450)는 초기화, 핸드오버, 재구성, 또는 리셋 이벤트가 있는지 여부를 결정한다. That is, the token bucket management entity 450 determines whether or not there is a initialization, handover, reconfiguration, or reset event. 리셋 이벤트가 있다면, 토큰 버킷 관리 엔티티(450)는 버킷 리셋 기능을 수행한다. If the reset event, the token bucket management entity 450 performs a bucket reset. 버킷 재구성이 있다면, 토큰 버킷 관리 엔티티(450)가 버킷 재구성 기능을 수행한다. If the bucket reconstruction, the token bucket management entity 450 performs a bucket reconfiguration. WTRU(410)는 하나의 토큰 업데이트 시간 간격에 대응하는 토큰의 양으로 PBR 버킷들을 초기화하도록 구성될 수 있다. WTRU (410) may be configured to initialize the PBR buckets to the amount of tokens corresponding to one token update time interval. 추가로, WTRU(410)는 또한 하나의 토큰 업데이트 시간 간격에 대응하는 토큰의 양으로 MBR 버킷들을 초기화하도록 구성될 수 있다. Further, WTRU (410) may also be configured to initialize the MBR buckets to the amount of tokens corresponding to one token update time interval. 예를 들어, PBR은 Tj × PBRj의 값으로 초기화될 수 있는 한편, MBR은 Tj × MBRj의 값으로 초기화될 수 있다. For example, PBR is to be initialized to a value of Tj × PBRj other hand, MBR may be initialized to a value of Tj × MBRj. 비제로 값에 기초하여 토큰 버킷들을 초기화하는 것은, WTRU(410)로 하여금 세그먼테이션을 최소화하도록 허용하고, 추가적인 토큰들을 축적하는 필요성으로 인해 지연을 발생시키기 보다는 WTRU(410)가 스케쥴링 그랜트를 수신할 때 정보를 전송하도록 허용한다. It is based on the value of non-zero initialize the token bucket, when allows the WTRU (410) to minimize segmentation and, due to the need to accumulate additional token WTRU (410), rather than generating a delay has received the scheduling grant It allows to transmit information. 다른 방법으로, 버킷의 최대값은 업데이트 수만큼 곱해진 업데이트 레이트에서의 PBR 또는 MBR일 수 있다. Alternatively, the maximum value of the bucket may be the PBR or MBR at the update rate multiplied by the number of updates. 업데이트 수만큼 곱해진 버킷 업데이트는 버킷 지속시간(duration)으로 간주될 수 있다. Bucket update multiplied by the number of updates may be considered the bucket duration (duration). WTRU(410)는 N개의 토큰 업데이트 시간 간격에 대응하는 토큰의 양으로 PBR 및 MBR 버킷들을 초기화하도록 구성될 수 있다. WTRU (410) is in an amount of tokens corresponding to N token update time interval may be configured to initialize the PBR and MBR buckets. 예를 들어, PBR은 N × Tj × PBRj의 값으로 초기화될 수 있고 MBR은 N × Tj × MBRj의 값으로 초기화될 수 있으며, 여기서 Tj는 j 베어러에 대한 토큰 업데이트 시간 증가량이며, N은 재구성가능할 수 있는 정수이다. For example, PBR may be initialized to a value of N × Tj × PBRj and the MBR may be initialized to a value of N × Tj × MBRj, where Tj is a token updating time increment for j bearer, N will be reconstructed be an integer. N 값은 RRC를 이용하여 구성될 수 있다. The value for N may be configured using the RRC. 대안적으로, Nj는 N 대신에 이용될 수 있다. Alternatively, Nj may be used in place of N.
WTRU(410)는 또한 PBR 및 MBR 버킷들을 이들의 최대값으로 초기화하도록 구성될 수 있다. WTRU (410) may also be configured to initialize the PBR and MBR buckets to their maximum values. 버킷은 버킷이 축적되도록 허용된 최대수의 토큰들로 초기화될 수 있다. The bucket may be initialized to a maximum number of tokens the bucket is allowed to accumulate. 버킷이 이 레벨에 도달하면, 버킷은 후속하는 버킷 업데이트 간격에서는 그 크기가 증가하지 않는다. When the bucket reaches this level, the bucket is in the subsequent bucket update intervals that do not increase in size. 업데이트의 최대수(N)만큼 곱해진 버킷 업데이트 레이트는 최대 버킷 지속시간으로 간주될 수 있다. Bucket multiplied by the maximum number (N) of update The update rate may be considered the maximum bucket duration. WTRU(410)는 PBR 및 MBR 버킷들을 제로로 초기화하도록 구성될 수 있다. WTRU (410) may be configured to initialize the PBR and MBR buckets to zero. 다른 방법으로, WTRU(410)는 PBR 및 MBR 버킷들을 RRC 메시지에서 전달된 RRC 정보 엘리먼트(IE)를 이용하여 나타낸 미리 정해진 값으로 초기화하도록 구성될 수 있다. Alternatively, WTRU (410) may be configured to reset to pre-determined value indicated by the RRC information element (IE) passing the PBR and MBR buckets in the RRC message. 이들 IE는 초기값을 포함할 수도 있고 또는 PBR 및/또는 MBR 토큰 업데이트 크기, 업데이트 주기성 및 최대 버킷 크기 또는 버킷 지속시간을 포함할 수도 있다. The IE may include may include an initial value and or the PBR and / or MBR token update size, the update periodicity, and the maximum bucket size or bucket duration. 토큰 버킷들은 핸드오버시 또는 MAC 리셋시 유지될 수 있고, WTRU(410)는 핸드오버 또는 MAC 리셋 동안 토큰 버킷 값들을 유지할 수 있다. Token buckets are able to be maintained during the handover or the MAC reset, WTRU (410) may maintain the token bucket values ​​during handover or a MAC reset. 이전 셀에서 결정된 PBR 및/또는 MBR 버킷들의 마지막 값을 새로운 셀의 초기 값으로서 적용한다. The last value of the PBR and / or MBR bucket determined in the previous cell is applied as the initial value of the new cell. 이로부터 서비스 연속성 및 인터럽션 시간의 최소화가 실현될 수 있다. From this, a continuity of service and inter minimizing interruption time can be realized. WTRU(410)는 핸드오버 동안에 또는 MAC 리셋 동안에 토큰 버킷 값들을 재초기화하지 않도록 구성될 수 있거나 또는 WTRU(410)는 모든 핸드오버 이벤트 동안 토큰 버킷 값들을 유지하도록 구성될 수 있다. WTRU (410) may be configured or can be configured to not re-initialize the token bucket values ​​during handover or during a MAC reset or the WTRU (410) is to maintain the token bucket values ​​during all handover events. WTRU(410)는 MAC 리셋 동안에 미리 정해진 RRC 표시를 이용하여 WTRU(410)가 토큰 버킷 값들을 유지할 수 있는지 또는 토큰 버킷 값들을 재초기화할 수 있는지 여부를 나타내도록 구성될 수 있다. WTRU (410) may be in advance by using a predetermined RRC indication WTRU (410) during a MAC reset is configured to indicate whether it is possible to re-initialize the token bucket number that the token bucket value or maintain the value. 미리 정해진 RRC 표시는 RRC 프리마티브 또는 RRC IE일 수 있다. A predetermined RRC indication may be an RRC Prima creative or RRC IE. 추가로, 토큰 버킷들의 메인터넌스가 논리 채널들에 선택적으로 적용될 수 있다. In addition, the maintenance of the token bucket may optionally be applied to the logical channel. 예를 들어, 논리 채널들의 토큰 버킷 값은 유지될 수 있는 반면 다른 논리 채널들의 토큰 버킷 값은 재초기화된다. For example, a token bucket value of the logical channel is initialized, which may be maintained while the token bucket value of another logical channel material. 다른 방법으로, 토큰 버킷들이 핸드오버 또는 MAC 리셋 동안에 재초기화된다면 WTRU(410)는 핸드오버 또는 MAC 리셋 동안에 토큰 버킷들을 비제로 값으로 재초기화하도록 재구성될 수 있다. Alternatively, WTRU if the token buckets are re-initialized during the handover or the MAC reset 410 may be reconfigured to reinitialize the token bucket values ​​during handover or a MAC reset to a non-zero. 예를 들어, 버킷은 PBR * Tj 또는 N * PBR * Tj로 초기화될 수 있다. For example, the bucket may be initialized to PBR * Tj or N * PBR * Tj. WTRU(410)는 LTE내 핸드오버 동안에 하나의 셀 또는 eNB(420)로부터 다른 셀 또는 eNB로 이동할 수 있다. WTRU (410) may move from one cell or eNB (420) to another cell or eNB during the handover in LTE. 핸드오버 동작 동안, MAC 엔티티는 리셋될 수도 또는 재구성될 수도 있다. During handover, MAC entity may be reset or reconfigured may be. RLC 리셋 또는 상위 계층 리셋으로 인해 발생할 수 있는 무선 링크 실패가 있을 때, MAC 엔티티는 또한 리셋될 수도 또는 재구성될 수도 있다. When the RLC reset or wireless link failure can be caused by a higher layer reset, MAC entity may also be reconfigured may be reset or not. 이들의 각각의 경우, 토큰 버킷은 위에서 설명된 바와 같이 리셋될 수도 또는 유지될 수도 있다. In each case of these, the token bucket may be reset or may be maintained as described above. WTRU(410)의 PBR 또는 MBR은 임의의 시간에 또는 핸드오버 동안에 eNB(420)에 의해 재구성될 수 있다. PBR or the MBR of the WTRU (410) may be reconfigured by the eNB (420) at any time or during a handover. 추가적으로, WTRU(410)의 PBR 및/또는 MBR 재구성은 MAC 재구성 절차의 일부분으로서 수행될 수 있다. Additionally, PBR and / or MBR reconfiguration of the WTRU (410) may be performed as part of a MAC reconfiguration procedure. 그 결과, WTRU(410)는 새롭게 구성된 비트 레이트에 따라 자신의 토큰 버킷들을 재초기화하는 것이 필요할 수 있다. As a result, WTRU (410) may be necessary to re-initialize its token buckets in accordance with a new configured bit rate. 토큰 버킷 관리 엔티티(450)는 RRC 계층에 위치될 수 있거나 또는 MAC 계층(도시 생략)에 위치될 수 있다. The token bucket management entity 450 may be located or may be located at RRC layer or MAC layer (not shown). 토큰 버킷 크기의 계산은 MAC에 의해 또는 RRC에 의해 수행될 수 있다. Calculation of the token bucket size can be performed by the RRC or by the MAC. 토큰 버킷 크기가 RRC에 의해 수행된다면, RRC는 MAC을 재구성할 수 있다. If the token bucket size performed by the RRC, RRC may reconfigure the MAC. 이는 MAC과 RRC 사이에 프리마티브의 시그널링을 필요로 할 수 있다. This may require signaling of creamer Creative between MAC and RRC. 예를 들어, MAC은 재구성시 자신의 현재 버킷 값들을 RRC에 제공한다. For example, MAC will provide the RRC their current bucket values ​​upon reconfiguration. 그 후, RRC는 시그널링된 정보 및 재구성 파라미터들을 이용하여 새로운 버킷 값들을 계산한다. Then, RRC computes new bucket values ​​using the signaled information and reconfiguration parameters. RRC는 새로운 버킷 값들을 MAC에 시그널링한다. The RRC signaling in the MAC new bucket values. PBR 또는 MBR 재구성시, WTRU(410)는 토큰 버킷들을 재초기화하도록 구성될 수 있다. PBR or MBR reconfiguration when, WTRU (410) may be configured to re-initialize the token buckets. WTRU(410)는 토큰 버킷들의 크기를 비교하도록 구성될 수 있고 WTRU(410)는 토큰 버킷들의 크기를 재조정 또는 스케일링하도록 구성될 수 있다. WTRU (410) may be configured to compare the size of token buckets, and WTRU (410) may be configured to readjust or scale the size of the token bucket. PBR 또는 MBR 재구성시, WTRU(410)는 PBR 버킷 및 MBR 버킷을 PBR 버킷 및 MBR 버킷의 최대 값으로 각각 초기화함으로써 토큰 버킷들을 재초기화할 수 있다. When PBR or MBR reconfiguration, WTRU (410) may re-initialize the token buckets by initializing the PBR bucket and MBR bucket, respectively, the maximum value of the PBR bucket and MBR bucket. WTRU(410)는 PBR 버킷 또는 MBR 버킷을 N개의 토큰 업데이트 시간 간격들에 대응하는 토큰의 양으로 초기화하도록 구성될 수 있다. WTRU (410) may be configured to reset to the amount of tokens corresponding to the PBR or MBR bucket bucket to the N token update time interval. 예를 들어, PBR은 N × Tj × PBRj의 값을 초기화될 수 있고 MBR은 N × Tj × MBRj의 값으로 초기화될 수 있으며 여기서 Tj는 j 베어러들에 대한 토큰 업데이트 시간 증가값이고 N은 재구성가능할 수 있는 정수이다. For example, PBR may be initialized to the value of the N × Tj × PBRj and the MBR may be initialized to a value of N × Tj × MBRj, where Tj is incremented token update time values ​​for j bearer and N is possible reorganization be an integer. N의 값은 RRC를 이용하여 구성될 수 있다. The value of N may be configured using the RRC. 다른 방법으로, Nj를 N 대신에 이용할 수 있다. Alternatively, Nj may be used in place of N.
다른 방법으로, WTRU(410)는 PBR 버킷 및 MBR 버킷을 이들의 최대 값으로 초기화할 수 있거나 또는 PBR 버킷 및 MBR 버킷을 제로로 초기화할 수 있다. Alternatively, WTRU (410) may be initialized to PBR bucket and MBR buckets to their maximum values, or initialize the PBR bucket and MBR buckets to zero. 다른 방법으로, WTRU(410)는 PBR 버킷 및 MBR 버킷을 RRC 메시지 내에서 전달되는 RRC IE들을 이용하여 나타내어진 미리 정해진 값들로 초기화할 수 있다. Alternatively, WTRU (410) may be initialized with predetermined values ​​eojin indicated using RRC IE that is passed to PBR bucket and MBR bucket in the RRC message. WTRU(410)는 PBR 토큰 버킷 및 MBR 토큰 버킷을 하나의 토큰 업데이트 시간 간격에 대응하는 토큰의 양으로 초기화할 수 있다. WTRU (410) may be reset to the amount of tokens corresponding to a PBR token bucket and MBR token bucket to a token update time interval. 예를 들어, PBR은 Tj × PBRj의 값으로 초기화될 수 있고 MBR은 Tj × MBRj의 값으로 초기화될 수 있으며 여기서 Tj는 토큰 업데이트 시간 증가값이다. For example, PBR may be initialized to a value of Tj × PBRj and the MBR may be initialized to a value of Tj × MBRj, where Tj and is a token updating time increment value. PBR 또는 MBR 재구성시, WTRU(410)의 RRC 엔티티 또는 WTRU(410)의 MAC 엔티티는 새롭게 특정된 최대 버킷 크기와 토큰 버킷의 현재 크기를 비교하도록 구성될 수 있다. When PBR or MBR reconfiguration, the RRC entity or MAC entity WTRU (410) in the WTRU (410) may be configured to compare the current size of a newly specified maximum bucket size and token bucket. 현재 토큰 버킷 크기가 새로운 최대 버킷 크기보다 더 작다면, WTRU(410)는 현재 버킷 크기를 유지하도록 구성될 수 있다. If the current token bucket size is smaller than the new maximum bucket size, WTRU (410) may be configured to maintain the current bucket size. 현재 토큰 버킷 크기가 새로운 최대 버킷 크기보다 더 크다면, WTRU(410)는 버킷 크기를 새로운 최대 버킷 크기로 설정하도록 구성될 수 있다. If the current token bucket size is larger than the new maximum bucket size, WTRU (410) may be configured to set the bucket size to the new maximum bucket size. 버킷 크기의 현재 버킷 크기의 최소값으로의 설정 및 버킷 크기의 새로운 최대 버킷 크기로의 설정은 또한 토큰 버킷 클램핑으로서 불려질 수 있다. Set to the bucket size for the current bucket size and the minimum value set to the bucket size of the new maximum bucket size may also be referred to as token bucket clamping. PBR 또는 MBR 재구성시, WTRU(410)의 RRC 엔티티 및 WTRU(410)의 MAC 엔티티는 최대 버킷 크기의 비에 비례하여 토큰 버킷 크기를 재조정 또는 스케일링하도록 구성될 수 있다. When PBR or MBR reconfiguration, MAC entity of the WTRU (410) RRC entity and the WTRU (410) of may be configured to readjust or scale the token bucket size in proportion to the ratio of the maximum bucket size. 예를 들어, 새로운 토큰 버킷의 수는 이전의(old) 최대 버킷 크기에 대한 새로운 최대 버킷 크기의 비와 이전의 토큰들의 수와의 곱의 함수이다. For example, the number of the new token bucket is a previous (old) a function of the product of the number of the new maximum bucket size ratio of the previous token for a maximum bucket size. 그 후, 토큰 버킷은 새로운 최대 버킷 크기에 대한 이전의 최대 버킷 크기의 비에 비례하여 스케일링된다. Then, the token bucket is scaled relative to the old maximum bucket size to the new maximum bucket size ratio. 다른 방법으로 토큰 버킷 크기는 비트 레이트의 비에 비례하여 스케일링될 수 있다. Alternatively, the token bucket size may be scaled in proportion to the ratio of the bit rate. 예를 들어, 새로운 토큰의 수는 이전의 비트 레이트에 대한 새로운 비트 레이트의 비와 이전의 토큰들의 수와의 곱의 함수이다. For example, the number of new tokens is a function of the product of the ratio of the previous token, the new bit rate to the old bit rate. 그 후, 토큰 버킷은 새로운 비트 레이트에 대한 이전의 비트 레이트의 비로 스케일링된다. Then, the token bucket is scaled ratio of the bit rate of the old for the new bit rate. 도 6은 토큰 상태 리포트에 대한 도면을 나타낸다. 6 shows a diagram for the token status report. eNB(420)는 WTRU(410)로하여금 토큰 상태 리포트를 발생시키도록 요구하는 요청을 WTRU(410)에 전송한다(단계 605). eNB (420) will allow the WTRU (410) transmitting a request demanding to generate a token status report to the WTRU (410) (step 605). eNB(420)로부터의 요청은 새로운 MAC 제어 엘리먼트 또는 RRC 메시지 내의 RRC IE의 일부로서 수신될 수 있다. A request from the eNB (420) may be received as part of an RRC IE in a new MAC control element or an RRC message. WTRU(410)에 요청을 전송하라고 eNB(420)에 트리거하는 이벤트는 eNB 구현에 의해 결정된다. Me to send a request to the WTRU (410) event that triggers the eNB (420) is determined by the eNB implementation. 예를 들어, 트리거링은 아래 정의된 바와 같을 수 있다. For example, triggering may be as defined below. WTRU(410)는 eNB(420)에 의해 요청된 토큰 상태 리포트를 발생시키도록(단계 610) 구성될 수 있다. WTRU (410) may be configured to generate the token status report requested by the eNB (420) (step 610). WTRU(410)는 트리거링 이벤트시 토큰들의 총량을 전송하도록 구성될 수 있다. WTRU (410) may be configured to transmit total amount of tokens upon a triggering event. 이 정보는 버퍼 상태 리포트(BSR; Buffer Status Report)의 부분으로서 전송될 수 있다(단계 615). This information is the buffer status report; may be sent as part of the (Buffer Status Report BSR) (step 615). WTRU(410)는 WTRU(410)의 현재 PBR 또는 MBR 토큰 버킷 값들을 포함하는 토큰 상태 리포트를 전송하도록 구성될 수 있다. WTRU (410) may be configured to transmit the token status report containing the current PBR or MBR token bucket values ​​of the WTRU (410). 토큰 상태 리포트는 또한 토큰 버킷들로부터 유도된 또는 토큰 버킷들에 관련된 임의의 정보를 포함할 수 있다. Token status report may also contain any information related to a token bucket, or derived from the token buckets. 토큰 상태 리포트들은 BSR에 대한 증대부(enhancement)로서 포함될 수 있다. Token status reports may be included as jeungdaebu (enhancement) of the BSR. 예를 들어, 증대된 BSR은 토큰 버킷들의 정보를 포함할 수 있다. For example, the augmented BSR may include information of the token bucket. 토큰 상태 리포트들은 새로운 MAC 제어 엘리먼트 내에 포함될 수 있다. Token status reports may be included in the new MAC control element. 대안적으로, 토큰 상태 리포트들은 RRC 메시지 내에 포함된 RRC IE 내에 포함될 수 있다. Alternatively, the token status reports may be included in an RRC IE contained in a RRC message. WTRU(410)는 내부 트리거에 기초하여 토큰 상태 리포트를 발생시킬 수 있다. WTRU (410) may generate the token status report based on an internal trigger. 내부 트리거 및 트리거링 이벤트는 다음 중 임의의 하나 - 핸드오버, MAC 리셋, 특정 계층에서의 리셋, MAC 재구성, 특정 계층에서의 재구성, 및 eNB(420)로부터의 요청 - 일 수 있다. Internal trigger and the triggering event is any one of the following: - may be - a request from the handover, MAC reset, a reset at specific layer, MAC reconfiguration, reconfiguring at a specific layer, and eNB (420). 트리거링 이벤트 또는 내부 트리거는 임의의 다른 미리 정의된 시간 또는 이벤트에서 또는 주기적으로 발생할 수 있다. The triggering event or the internal trigger may occur periodically or on any other predefined time or event. WTRU(410)는 eNB(420)로부터의 요청에 응답하여 토큰 상태 리포트를 발생시키도록 구성될 수 있다. WTRU (410) may be configured in response to a request from the eNB (420) to generate a token status report. eNB(420)는 토큰 상태 리포트의 능력을 이용하여 스케쥴링 동작을 최적화할 수 있다. eNB (420) can optimize the scheduling operations using the capability of the token status report. eNB(420)는 토큰 상태 리포트 능력을 이용하여 WTRU(410)의 계산과 eNB(420)의 국부적 계산들을 동기시키도록 구성될 수 있다. eNB (420) may be configured to synchronize a local computation of the computation and eNB (420) in the WTRU (410) using the token status report capability. 추가로, eNB(420)는 토큰 상태 리포트 능력을 수신한 후 토큰 버킷 값들 또는 비트 레이트 파라미터들을 재구성할 수 있다. In addition, eNB (420) may, after receiving the token status report capability to reconfigure the token bucket values ​​or bit rate parameter. 토큰 상태 리포트는 PBR 또는 MBR 버킷들의 절대 크기, PBR 또는 MBR의 최대 버킷 크기에 대한 PBR 또는 MBR 버킷 크기, PBR 또는 MBR 버킷이 풀 상태인지 여부를 나타내는 비트, PBR 또는 MBR 버킷이 빈 상태인지 여부를 나타내는 비트, WTRU(410)가 PBR 또는 MBR 제약을 받는지 여부를 나타내는 표시부 또는 PBR 또는 MBR 토큰들로부터 유도된 또는 PBR 또는 MBR 토큰들에 관련된 임의의 다른 정보를 포함할 수 있다. Token status report whether the PBR or of the MBR buckets absolute size, PBR or about MBR maximum bucket size of the PBR or MBR bucket size, a bit indicating whether the PBR or the MBR buckets full status, PBR or MBR bucket is empty indicating bit, the WTRU (410) may include any other information, related to the PBR or MBR token or derived from the PBR or MBR token display or whether they indicate whether the PBR or MBR limited. 이 정보는 복수의 논리 채널들 또는 버킷들에 걸쳐 집결될 수 있거나 또는 논리 채널마다 집결될 수 있다. This information may be gathered each time can be gathered over a plurality of logical channels or buckets, or logical channels. BSR은 BSR을 확장함으로써 토큰 상태 리포트 정보를 제공하도록 증대될 수 있다. BSR can be increased to provide the token status report information by expanding the BSR. 예를 들어, BSR은 확장 플래그를 포함할 수 있다. For example, BSR may include an extension flag. 다른 방법으로, WTRU(410)는 스케쥴링 하의 eNB(420)를 지원하도록, 축적된 토큰들, PBR 또는 MBR 토큰들의 총량을 BSR의 부분으로서 eNB(420)에 전송하도록 구성될 수 있다. Alternatively, WTRU (410) may be configured of, the accumulated tokens to support scheduling under the eNB (420), the total amount of PBR or MBR token as part of the BSR to be transmitted to the eNB (420). 다른 방법으로, WTRU(410)는 RRC IE에 의해 구성될 수 있는 미리 정해진 문턱값과 축적된 토큰들을 비교하도록 구성될 수 있다. Alternatively, WTRU (410) may be configured to compare a predetermined threshold and the accumulated tokens that can be configured by the RRC IE. 그 후, WTRU(410)는 축적된 토큰량이 미리 정해진 문턱값을 충족한다면 1의 값을 보고하고 축적된 토큰량이 미리 정해진 문턱값을 충족하는 것을 실패한다면 0의 값을 보고하도록 구성될 수 있다. Then, WTRU (410) that if the amount of accumulated tokens meets the predetermined threshold can be configured if it fails the amount reported a value of 1 and stored tokens that satisfy a predetermined threshold to report a value of zero. 1. 토큰 버킷을 비제로 값으로 초기화하도록 구성된 프로세서를 포함하는 WTRU. 1. WTRU comprising a processor configured to initialize a token bucket to a non-zero value. 2. 실시예 1에 있어서, 스케쥴링 그랜트를 수신하도록 구성된 수신기와; 2. For Example 1, and the receiver configured to receive a scheduling grant; 그랜트를 수신하는 것에 응답하여 데이터를 전송하도록 구성된 송신기를 더 포함하는 WTRU. WTRU in response to receiving a grant comprising a transmitter configured to transmit data more. 3. 실시예 1 또는 2에 있어서, 프로세서는 또한, 우선순위가 정해진 비트 레이트(PBR)의 최대 값에 기초하여 토큰 버킷을 초기화하도록 구성된 것인 WTRU. 3. In Example 1 or 2, wherein the processor is further priority is configured to initialize the token bucket based on a maximum value of a given bit rate (PBR) WTRU. 4. 실시예 3에 있어서, PBR은 토큰 업데이트 시간 간격에 따라 토큰들의 양에 기초하여 초기화되는 것인 WTRU. 4. In the third embodiment, the PBR is initialized based on an amount of the tokens according to a token update time interval WTRU. 5. 매체 접속 제어(MAC) 리셋을 개시하도록 구성된 프로세서를 포함하는 WTRU. 5. WTRU comprising a medium access control (MAC) processor configured to initiate a reset. 6. 실시예 5에 있어서, 프로세서는 또한, MAC 리셋 동안에 토큰 버킷의 값을 유지하도록 구성된 것인 WTRU. 6. The method of embodiment 5, wherein the processor is further configured to maintain the value of the token bucket during the MAC reset WTRU. 7. 실시예 5 또는 6에 있어서, 프로세서는 또한, 핸드오버 커맨드에 응답하여 MAC 리셋을 개시하도록 구성된 것인 WTRU. 7. The method of embodiment 5 or 6, wherein the processor is further is configured to initiate the MAC reset in response to the handover command WTRU. 8. 실시예 6 또는 7에 있어서, 토큰 버킷의 값은 논리 채널이 확립되었을 때까지 유지되는 것인 WTRU. 8. In the embodiment 6 or 7, the value of the token bucket is maintained until a logical channel is established WTRU. 9. 핸드오버를 트리거하도록 구성된 프로세서를 포함하는 WTRU. 9. WTRU comprising a processor configured to trigger a handover. 10. 실시예 9에 있어서, 프로세서는 또한, 핸드오버 동안에 매체 접속 제어(MAC) 계층을 리셋하고, 토큰 버킷을 비제로 값으로 리셋하도록 구성된 것인 WTRU. 10. In the ninth embodiment, the processor is further reset the hand-over a medium access control (MAC) layer, and during, the token bucket is configured to be reset to a non-zero value WTRU. 11. 실시예 10에 있어서, 프로세서는 이전의 최대 버킷 크기에 대한 새로운 최대 버킷 크기의 비에 기초하여 토큰 버킷들을 리셋하도록 구성된 것인 WTRU. 11. The method of embodiment 10, wherein the processor is configured to reset the token buckets based on the new maximum bucket size to the old maximum bucket size ratio WTRU. 12. 실시예 10 또는 11에 있어서, 프로세서는 또한, 재구성에 응답하여 새롭게 미리 정해진 최대 버킷 크기와 현재 토큰 버킷 크기를 비교하도록 구성된 것인 WTRU. 12. The method of embodiment 10 or 11, wherein the processor is further configured to in response to the reconfiguration the newly predetermined maximum bucket size to compare the current token bucket size WTRU. 13. 실시예 12에 있어서, 현재 크기가 최대 버킷 크기보다 더 작다면, 프로세서는 현재 토큰 버킷 크기를 유지하는 것인 WTRU. 13. In the embodiment 12, a current size to, if less than the maximum bucket size, then the processor maintains the current token bucket size WTRU. 14. 실시예 12 또는 13에 있어서, 현재 크기가 최대 버킷 크기보다 더 크다면, 프로세서는 토큰 버킷 크기를 최대 크기로 이용하는 것인 WTRU. 14. In the embodiment 12 or 13, if the current size is larger than the maximum bucket size, then the processor would WTRU using the token bucket size to the maximum size. 15. 실시예 10 내지 14 중 어느 하나에 있어서, 프로세서는 또한, 새로운 최대 크기 및 이전의 최대 크기의 비에 기초하여 토큰 버킷들을 재조정하도록 구성된 것인 WTRU. 15. The embodiment according to any one of embodiments 10 to 14, wherein the processor is further based on the new maximum size and transfer of the full-size ratio is configured to readjust the token buckets WTRU. 16. 실시예 10 내지 15 중 어느 하나에 있어서, 프로세서는 새로운 비트 레이트 및 이전의 비트 레이트의 비에 기초하여 토큰 버킷들을 재조정하는 것인 WTRU. 16. The embodiment according to any one of embodiments 10-15, wherein the processor is to readjust the token buckets based on a ratio of a new bit rate and the bit rate of the previous WTRU. 17. 실시예 10 내지 16 중 어느 하나에 있어서, 프로세서는 또한, 우선순위가 정해진 비트 레이트(PBR)의 최대 값에 기초하여 토큰 버킷들을 재초기화하도록 구성된 것인 WTRU. 17. A method according to any one of Examples 10 to 16, wherein the processor is further priority is configured to re-initialize the token bucket based on a maximum value of a given bit rate (PBR) WTRU. 18. 토큰 상태 리포트를 발생시키라는 요청 - 요청은 매체 접속 제어(MAC) 엘리먼트의 일부로서 수신됨 - 을 수신하도록 구성된 수신기를 포함하는 WTRU. WTRU comprising a receiver configured to receive a - 18 in case of the token status report is requested Kira-search request is received as part of a medium access control (MAC) element. 19. 실시예 18에 있어서, 요청에 응답하여 토큰 상태 리포트를 발생시키도록 구성된 프로세서와, 버퍼 상태 리포트의 일부로서 토큰들의 총량을 전송하도록 구성된 송신기를 포함하는 WTRU. 19. In Example 18, the WTRU comprising a transmitter configured to transmit total amount of tokens as part of and configured to generate a token status report in response to the requesting processor, the buffer status report. 20. 실시예 18 또는 19에 있어서, 요청은 MAC 리셋에 응답하여 수신되는 것인 WTRU. 20. In the embodiment 18 or 19, the request would be received in response to a MAC reset WTRU. 21. 실시예 18 내지 20 중 어느 하나에 있어서, 요청은 MAC 재구성에 응답하여 수신되는 것인 WTRU. 21. A method according to any one of embodiments 18 to 20, the request would be received in response to a MAC reconfiguration WTRU. 22. 실시예 18 내지 21 중 어느 하나에 있어서, 요청은 계층의 리셋에 응답하여 수신되는 것인 WTRU. 22. The embodiment according to any one of embodiments 18 to 21, wherein the request is received in response to a reset of a layer WTRU. 23. 실시예 18 내지 22 중 어느 하나에 있어서, 요청은 계층의 재구성에 응답하여 수신되는 것인 WTRU. 23. A method according to any one of embodiments 18 to 22, wherein the request is received in response to reconfiguration of a layer WTRU. 24. 실시예 19에 있어서, 송신기는 또한, 우선순위가 정해진 비트 레이트(PBR) 토큰 버킷 값을 포함하는 토큰 상태 리포트를 전송하도록 구성된 것인 WTRU. 24. In Example 19, the transmitter is also, priority is given bit rate (PBR) is configured to transmit the token status report containing the token bucket value WTRU. 특징들 및 요소들이 실시예들에서 특정 조합으로 설명되어 있지만, 각각의 특징 또는 요소는 실시예들의 다른 특징들 및 요소들 없이 단독으로, 또는 다른 특징들 및 요소들을 갖고 또는 갖지 않고 여러 조합들로 이용될 수 있다. The features and although elements are described in particular combinations in embodiments, with each feature or element alone without the other features and elements of the embodiments, or other features, and has the elements or in various combinations without having It can be used. 여기에 제공된 방법들 또는 흐름도들은 범용 컴퓨터 또는 프로세서에 의한 실행을 위해 컴퓨터 판독가능 저장 매체에서 실체적으로 구현되는 컴퓨터 프로그램, 소프트웨어, 또는 펌웨어로 실행될 수 있다. The methods or flow charts provided herein may be implemented as a computer program, software, or firmware implemented in a computer-readable storage medium for execution by a general purpose computer or a processor tangibly. 컴퓨터 판독가능 저장 매체들의 예들은 판독 전용 메모리(ROM), 무작위 액세스 메모리(RAM), 레지스터, 캐시 메모리, 반도체 메모리 디바이스, 내부 하드 디스크 및 착탈 가능 디스크와 같은 자기 매체, 자기 광학 매체, 및 CD-ROM 디스크 및 디지털 다기능 디스크(DVD)와 같은 광학 매체를 포함한다. Examples of computer-readable storage media include read-only memory (ROM), random access memory (RAM), a register, cache memory, semiconductor memory devices, such as internal hard disk and removable disk, magnetic media, magneto-optical media, and CD- ROM disk and an optical medium such as a digital versatile disk (DVD). 적절한 프로세서들은 예를 들어, 범용 프로세서, 특수 목적 프로세서, 통상적인 프로세서, 디지털 신호 프로세서(DSP), 복수의 마이크로프로세서, DSP 코어와 관련된 1 이상의 마이크로프로세서, 컨트롤러, 마이크로컨트롤러, 응용 주문형 직접 회로(ASIC), 필드 프로그래밍가능 게이트 어레이(FPGA) 회로, 임의의 기타 유형의 집적 회로(IC), 및/또는 상태 머신을 포함한다. Suitable processors include, for example, a general purpose processor, a special purpose processor, a conventional processor, a digital signal processor (DSP), a plurality of microprocessors, one or more microprocessors in conjunction with a DSP core, a controller, a microcontroller, an application specific integrated circuit (ASIC ), a field programmable gate array (FPGA) circuit, and includes any other type of integrated circuit (IC), and / or a state machine. 소프트웨어와 관련된 프로세서는 WTRU, UE, 단말기, 기지국, 무선 네트워크 컨트롤러(RNC) 또는 임의의 호스트 컴퓨터에 이용하기 위한 무선 주파수 트랜시버를 구현하는데 이용될 수 있다. A processor associated with software may be used to implement a radio frequency transceiver for use in a WTRU, UE, terminal, base station, radio network controller (RNC), or any host computer. WTRU는 카메라, 비디오 카메라 모듈, 비디오폰, 스피커폰, 바이블레이션 디바이스, 스피커, 마이크로폰, 텔레비젼 트랜시버, 핸드 프리 헤드셋, 키보드, 블루투스® 모듈, 주파수 변조(FM) 무선 유닛, 액정 디스플레이(LCD) 표시 유닛, 유기 발광 다이오드 (OLED) 표시 유닛, 디지털 뮤직 플레이어, 미디어 플레이어, 비디오 게임 플레이어 모듈, 인터넷 브라우저, 및/또는 임의의 무선 근거리 통신 네트워크(WLAN) 모듈 또는 초광대역(UWB) 모듈과 같이, 하드웨어 및/또는 소프트웨어로 구현되는 모듈과 결합하여 이용될 수 있다. The WTRU camera, a video camera module, a videophone, a speakerphone, Bible illustration device, a speaker, a microphone, a television transceiver, a hands free headset, a keyboard, a Bluetooth ® module, a frequency modulated (FM) radio unit, a liquid crystal display (LCD) display unit, as the organic light emitting diode (OLED) display unit, a digital music player, a media player, a video game player module, an Internet browser, and / or any wireless local area network (WLAN) module, or ultra-wideband (UWB) module, hardware, and / or it may be used in conjunction with modules, implemented in software. 각각의 스케쥴링 기회 TTI(transmission time interval)에서, 스케쥴링 그랜트를 수신하는 것에 응답하여 상기 선택된 데이터를 송신하도록 구성되는 송신기를 포함하는, 무선 송수신 유닛. Each scheduling opportunity TTI (transmission time interval) in, in response to receiving a scheduling grant for a transmitter configured to transmit the selected data, the WTRU. 상기 프로세서는 또한, MBR(maximum bit rate) 버킷 값을 한 토큰 업데이트 시간 간격에 대응하는 토큰들의 양으로 초기화하도록 구성되는 것인, 무선 송수신 유닛. The processor further, MBR (maximum bit rate) is, the wireless transmitting and receiving unit is configured to initialize the token bucket value of the amount corresponding to one token update time interval. 상기 프로세서는 또한, 총 업데이트의 횟수로 곱해진 버킷 업데이트 레이트에 기초해서 버킷 지속시간(duration)을 결정하도록 구성되는 것인, 무선 송수신 유닛. The processor further, in being configured on the basis of the bucket update rate multiplied by the total number of updates to determine a bucket duration (duration), wireless transmit receive unit. 상기 프로세서는 또한, 상기 PBR 버킷 값과 MBR(maximum bit rate) 버킷 값을 0으로 초기화하도록 구성되는 것인, 무선 송수신 유닛. The processor further, the PBR bucket values ​​and MBR (maximum bit rate) is, the WTRU is configured to reset the bucket to zero. RRC(radio resource control) 메시지 내에서 운반되는 RRC IE(information element, 정보 요소)들을 사용해서 표시되는 미리 정의된 값으로 PBR 버킷 값과 MBR(maximum bit rate) 버킷 값을 초기화하도록 구성되는 것인, 무선 송수신 유닛. The RRC (radio resource control), the pre-defined value PBR bucket values ​​and MBR (maximum bit rate) is displayed by using RRC IE (information element, IE) that is carried in the message is configured to reset the bucket value, WTRUs. 각각의 스케쥴링 기회 TTI(transmission time interval)에서, 스케쥴링 그랜트를 수신하는 것에 응답하여 상기 선택된 데이터를 송신하는 단계를 포함하는, 방법. In each scheduling opportunity TTI (transmission time interval), in response to receiving a scheduling grant for transmitting the selected data, and methods. MBR(maximum bit rate) 버킷 값을 한 토큰 업데이트 시간 간격에 대응하는 토큰들의 양으로 초기화하는 단계를 더 포함하는, 방법. MBR (maximum bit rate), the method further comprising the step of initializing the value of the bucket in an amount of tokens corresponding to one token update time interval. 총 업데이트의 횟수로 곱해진 버킷 업데이트 레이트에 기초해서 버킷 지속시간(duration)을 결정하는 단계를 더 포함하는, 방법. Based on the bucket update rate multiplied by the total number of update further comprises: determining a bucket duration (duration), method. 상기 PBR 버킷 값과 MBR(maximum bit rate) 버킷 값은 0으로 초기화되는 것인, 방법. The method of the PBR bucket values ​​and MBR (maximum bit rate) that the bucket value is initialized to zero. 상기 PBR 버킷 값과 MBR(maximum bit rate) 버킷 값은, RRC(radio resource control) 메시지 내에서 운반되는 RRC IE(information element, 정보 요소)들을 사용해서 표시되는 미리 정의된 값으로 초기화되는 것인, 방법. In that the PBR bucket values ​​and MBR (maximum bit rate) bucket value, RRC (radio resource control) RRC IE that is carried in the message, which is initialized to a predefined value that is displayed by using the (information element, IE), Way.